We could make a good argument that the whole our life under God might be summarized in those four words. Each of us is trying to be faithful. Furthermore, it’s difficult to believe that God really expect more from us than that. You see, God knows full well the challenges we confront in attempting to align our lives with his will. He knows how prone we are to stray, and to do things that cause grief to ourselves and others. The religious folks with whom Jesus interacted believed that adherence to the letter of the law would justify them in God’s sight. The scribe felt it essential to know by what standard he would be judged, and to apply his efforts according to the right priorities. This morning I have decided to share with you a bit of my personal journey in trying to be faithful. For those experiences, for the most part unexceptional, shape my self-understanding as a Christian and a minister, and have informed my approach to ministry with the congregations I have previously served, and most recently with you. Looking back from the last sentence of what I have prepared for this morning to this point I can’t say that I have really said what I had hoped to share this morning. But I believe the heading, “trying to be faithful” is as good a summary as I can offer. Let’s get started. I was born on November 24, 1946 in Glassport, PA to Leonard Miller and Arlene Wall Miller. My childhood upbringing was unexceptional. My sister and I were raised by two loving parents, regrettably more the exception than the rule today. Stressed economic circumstances prevented either of my parents from graduating from high school, both going to work to help support their families during, and in the aftermath of the depression. Dad ultimately found work as a foundry laborer, and mother as a waitress and later as a restaurant owner. I am proud of my parents. Both my parents worked very hard, a lesson not lost on my sister and me. My mother accomplishment in operating a twenty-four hour restaurant for twenty-five years particularly stands out, while the physical demands of my dad’s work broke him down physically. My first remembrance of church was a Christmas service. I may have been four at the time. A year or two later my family moved to the town that would be home until high school graduation. It happened that the apartment my parents rented was just down the street from a Free Methodist church. It was a very small congregation quite conservative in theological orientation. My parents for the most part didn’t attend, but encouraged my sister and my attendance. The pastor was a bi-vocational tentmaker [are you familiar with “tentmaker?” I remember him as a genuine nice man. However, it is of Ruth Davis, our Sunday school teacher I will retain a lasting memory. Mrs. Davis arranged various youth outings for the six or eight children in the Sunday school, and played piano in services of about our approximate size. I still have the King James version Bible given to me by Mrs. Davis in ’56. Both Mrs. Davis, and Betty Griesbach, with whom she often teamed, were important influences in my early life. Even as a kid I was impressed that Mrs. Davis, who worked fulltime in the local shoe factory, and was the primary caregiver for an invalid husband at home, would make time for us. Mrs. Davis has held a prominent place on occasions when I have been asked to talk about my faith journey. Our family would move after two or three years, and we concluded our association with the Free Methodist church, and effectively stopped attending church and attending Sunday until a Methodist pastor came calling. My parents joined the local Methodist church. They never became active members, and my sister and I never became involved in the Sunday school or youth programming. For the most part the people of that church were not the people with whom my parents generally associated. The church wasn’t a good fit. For the period roughly from twelve until eighteen years of age I didn’t attend worship. After graduation I enrolled at a state university. I dropped out after about six weeks into my first year. I was homesick, and over my head academically. It was a really bottoming out period. After a couple of months, however, I had an awakening that was transformative. I wouldn’t characterize it as a religious experience, but it was a profound experience nonetheless. Soon after I went to work in a foundry, a serious break from the sedentary life I had been living. Owing to the demands of the job and some vigilance about what I ate, I lost forty pounds of the over 190 pounds I carried at the time. It didn’t take me long to decide that a career in the foundry wasn’t for me. I returned to school. I dived into my studies with a vengeance. I made the Dean’s list each semester. During my sophomore year I met a girl who would become my wife. We married. I was twenty and she was and nineteen. We began to attend church. I don’t really know our motivation for doing so. Trudy’s parents were Presbyterian. This was my introduction to the Presbyterian Church. Her parents attended regularly, and we attended with them when we visited. Trudy and I continued attending various churches after I transferred to Macalester College in St. Paul, MN., a school that is nominally affiliated with the Presbyterian Church. After the service we moved back to St. Paul. I graduated from Mac in ’72. I’m not sure what motivated me to think about the pastoral ministry, however I did feel increasing a home in the church. I also received encouragement from a religion professor at Mac who suggested that I apply for a Rockefeller Foundation grant to do a trial year at seminary all expenses paid. Though I didn’t get the grant, at about that time I decided to apply to become a candidate for ministry in the Presbyterian Church. By that time Trudy and I had been attending a Presbyterian Church for several months. I ultimately was ordained as an elder. While living and working in St. Paul, first in sales for a division of McGraw-Hill, and later as a waiter, I took classes at a local seminary affiliated with the United Church of Christ. Ultimately I attended an inquirers weekend at Princeton Theological Seminary. I didn’t know what to expect. I was given an opportunity to meet with students who were very accommodating. Throughout the weekend I continued to process my sense of call to ministry, hoping to identify any sign that seminary might be a good fit. This went on right up to the last night of the experience. At a dinner that last night, the seminary president, Dr. James McCord spoke. 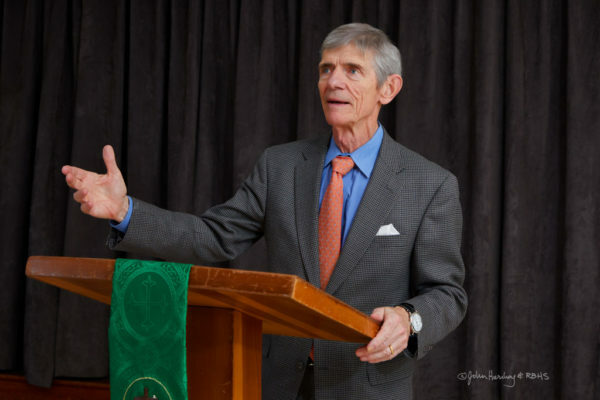 The lasting memory of have of Dr. McCord’s talk was his comment that there was never a time from his youth forward that he doubted his sense of call to the Christian ministry. That was very deflating for one feeling insecure in my own sense of call. Several months after that visit in 1975 the nine years of marriage ended. While my wife was opposed to my attending seminary, my personal failings were also prominent in the break. Newly divorced, I entered Princeton Seminary in September 1976, planning to focus on pastoral counseling. A counselor/therapist I worked with after the divorce told me that my focus on counseling was the common choice for those newly divorced. One course in counseling, however, was enough to tell me that counseling wasn’t for me. The fact is, I really didn’t focus on one concentration throughout my three years in seminary. I earned my degree in ’79 but had no real plan moving forward. Instead I enrolled for classes at the University of Strasbourg, Strasbourg, France. While I was invited to proceed into PhD studies, I soon concluded that that was not a path for me. I returned to the US after nine months, returning to Princeton to prepare papers to circulate for pastoral ministry. Though I had participated in interviews in Princeton no offers were forthcoming. After two or three weeks Christ headed out for summer work in the Sierras. I was left with decisions to make. It happened a family friend of Chris’s had a house in the Sunset district of SF. Being I had no other options for where I might lay my head, I took a room, and immediately found a job waiting tables. After some church shopping, I eventually became a member of Calvary Presbyterian Church. I was invited to teach adult Sunday school there, was ordained as a deacon, and was later installed as an elder. Calvary essentially amounted to an internship for me from1980-88. It was during that time I met Linda. We married in 1984. One of the best decisions I ever made. By 1986 I had received the various approvals I needed from San Francisco Presbytery to seek a pastoral call. I sent out dozens of resumes, and interviewed with churches in S. CA and in PA before accepting a call to serve as pastor in a three point charge in rural Minnesota. Three churches, three sermons, three separate boards. My experience in Minnesota, with wonderful support from Linda, was positive in all respects. I began to look into other options after seven and a half years. Having seen a notice in one of our Presbyterian publications I sent my papers to a church in New Orleans. I thought it was highly unlikely that I would hear from the church having had no experience in urban ministry. Ironically, as my papers were traveling to New Orleans, a packet from the New Orleans church was headed to me. They crossed in the mail. Was it Providence? Perhaps. A telephone interview followed, then a visit to preach, and then a third visit with Linda to meet with the committee. Though no offer was extended on our arriving the church had arranged for us to meet with a real estate agent. We were encouraged by that development, but didn’t want to presume anything. Ultimately we met with the committee for dinner and the offer was extended. One of the highlights of my life, and I think for Linda as well. Lakeview Presbyterian Church had a membership of approximately 400. The church was staffed an administrative assistant and a Christian educator. It ran a very highly regarded preschool or children 2-4 years of age. I was excited to accept new challenges the church offered. This was not rural Minnesota. The highlights of the ministry were working with the congregation to establish congregational vision and goals. I was privileged to work with a number of dedicated, faithful, and intelligent people. It was a also delight to worship in a wonderful worship space, with a great choir and pipe organ. Hurricane Katrina hit New Orleans on August 29, 2005. The Lakeview section of the city us among the neighborhoods of the city that saw major devastation. The church was flooded to a depth of over five feet. Our townhouse a mile from the church suffered the same fate. It was not until late September or early October that I got back into the city. At that time there was much discussion about the future of the city. Katrina was a historic event that raised profound questions about the viability of the city. There was, for instance, talk of converting large parcels of land that the flood had impacted into green space. Ultimately the citizens of the city made the crucial decisions pertaining to the future of the city. How? They moved back, many using insurance money and FEMA grants to back where they had been. Meanwhile the Presbyterian Church struggled with how to accommodate the new realities the churches of our city faced. Our church was structurally sound. We gutted the entire first floor offices, sanctuary, kitchen, and classrooms. We lost several members who decided not return. It took several months, but the church was built back better than it was before. There were new sanctuary furnishings, new heating and cooling, new kitchen. All of this was accomplished through insurance proceeds and the generosity of the denomination, and churches and individuals across the country. I doubt seriously if there has been one congregation so generously endowed. My salary and benefits and those of our administrative assistant and day school director were paid by the denomination for over a year. Post storm until my retirement at the end of 2012 presented many challenges, but I think we did well under the circumstances. The persistent challenge became the budget, and with that stress. It was time to move on. I had lost the motivation to continue. Linda and I planned to retire in SF where we own property that we purchased when we got married. After living in the city for eighteen months, however, we decided to look elsewhere. We looked into various options in cities in the North Bay, ultimately purchasing our current home in Healdsburg in December 2014. Not long after settling in Healdsburg I saw a notice in our presbytery office for a ministry in Bodega Bay at Fisherman’s Chapel. The rest, as they say, is history. Though I cannot point to one event alone in the story I related as being decisive in shaping my life and ministry, I believe that God’s hand has been present in and through the experiences I have had. Furthermore, I believe that God is active in your lives in the same mysterious ways he is active in mine. I believe that each of our destinies under God has already been worked out. That said, I believe God has called me, but also privileged me, to use the gifts with which he has endowed me, molded and stretched through the various experiences I have had, to effectively serve as one of your mentors and guide, but also a fellow traveler, in our joint endeavor of trying to be faithful. I’m excited that God seems committed to opening channels through which his abundant grace might reach us. We never know where our quest for clarity in discerning where God may be leading, but isn’t it a wonderful ride all the same? I think so. Gracious God, you have placed in our hearts a longing that cannot be appeased by the things offered in the world’s marketplace and the interpersonal relationships in which we engage. Even as we give thanks for the richness and the depth of fulfillment we are privileged to experience in our daily lives, you have reserved much more for each of us. It is that “more” we seek in the efforts we make trying to be faithful. Out of the mystery of your being, O God, a mystery, never fully disclosed to us mortals, you have spoken the word or life, even out of your abundant grace made that word incarnate in your son, our Lord Jesus Christ. In your covenants you pledge to never abandon us. Indeed, your providence directs us in our quest to learn and grow even in those events and experiences of life where we have rejected your counsel. Grant us renewed confidence to believe that your light is always shining though it may be obscured during a time of personal trial and testing. With gratitude, O Lord, we accept your invitation to worship today. We thank you for your Word and the words you have given us to speak in your honor and praise. May our words spoken and our songs sung be pleasing in your sight. May your Spirit, O God, renew its hold on each of our lives that we may offer to our communities and world living witness to your power and love. On this Veteran’s Day we remember the women and men who have proudly served our nation in the armed forces. We honor the dedication and commitment that has inspired their patriotism, even as we enjoy the freedom and security that their efforts have helped secure. Abide with those serving today, particularly those phasing the hazards of combat. Strengthen and sustain family and friends at home who are separated from loved ones in uniform. Finally, O Lord, you call us to be Sabbath keepers. Help us to grow into a more perfect understanding of what that means by deliberately allocating time today to disengage from our everyday pursuits, reserving time for you alone.